Crescent Island | Inventing Situations. 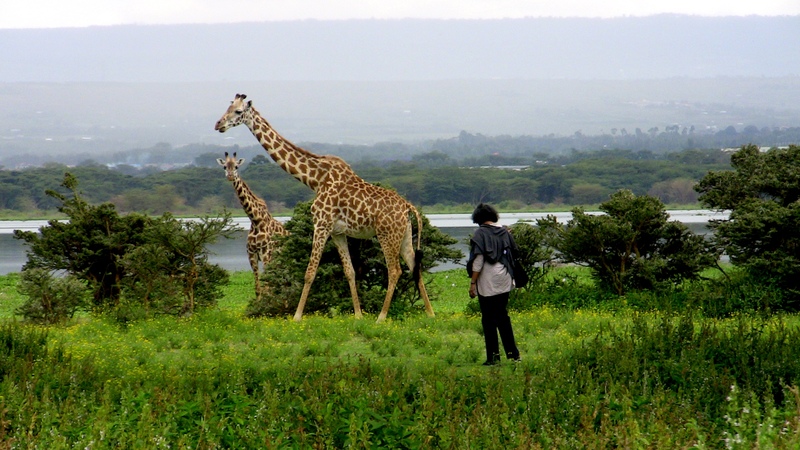 Uma Kambhampati wanders near some giraffes. Elizabeth came into town on Thursday, which has been really fun! On Saturday we took a trip to Crescent Island, on Lake Naivasha. It’s where the film Out of Africa was filmed way back in 1985. There weren’t any animals living on the island, though, so they shipped in a bunch of charismatic megafauna: zebra, gnu, Thompson’s gazelles, antelope, and, yes, giraffes. There aren’t any predators to thin out the herds, so the island, while small, is really packed with animals. And they’re pretty tame: one just walks around amongst them, no big deal. Along for the trip was Uma Kambhampati, a economics professor from Reading University. She was our friend Giovanna’s phd adviser, and was along with a delegation from Reading checking out institutions to partner with around Kenya. After the trip to the island, we had a giant late lunch at the Lake Naivasha Country Club, a kind of colonial time-capsule. And then we went into Nairobi and had a fantastic (and also large) dinner at About Thyme with a few other people from the Reading delegation. All in all a really great day!